3/4" scale, 3-1/2" gauge. Designed by Laverne Langworthy. Plain bearing type. Iron castings, made in USA. These trucks will look good under many type of tender, caboose, or freight car. 2 bolsters, 4 sideframes, 8 wheels, and a drawing, are included. 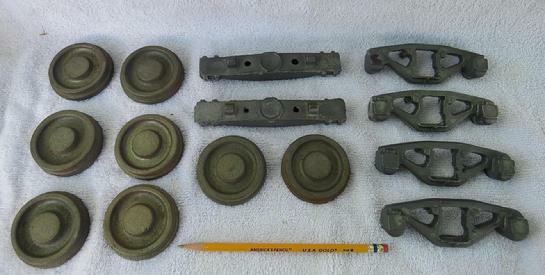 3/4" scale, 3-1/2" gauge "Bettendorf" type trucks, for tenders or freight cars. 2 bolsters, 4 sideframes, and 8 wheels in iron. Designed by Laverne Langworthy. Made in USA. 3/4" scale, 3-1/2" gauge. Made in USA. Designed by H.J. Coventry. These trucks will look terrific under many type of tender, or, under a 3/4" scale freight car of your own design. 2 bolsters, 4 sideframes, 8 wheels, 8 journal boxes (plain bearing type), and a drawing, are included. 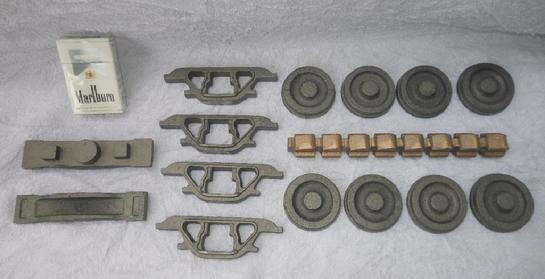 3/4" scale, 3-1/2" gauge "Andrews" type trucks, for tenders or freight cars. 2 bolsters, 4 sideframes, and 8 wheels in iron. 1 stick of 8 journal boxes, in bronze. Designed by H.J. Coventry. Made in USA. For shipping to countries other than the USA or Canada, please inquire.